Tempted to take a ramble the other weekend and get out of my ‘hood – as M said, we’re walkers – I decided to venture to the East Side after a brunch at Penelope put me on that side of the island. My life is centered on the West side, but it was my goal in moving to NYC to explore every neighborhood I could get to. Plus all there was all that hype because the UN was in session, so my several-hour-long ramble was a must. Moving up through Murray Hill (I could see the frat factor this neighborhood is known for, but its actually pretty… gorgeous townhouses), I walked over to the UN (diplomats! languages! flags! 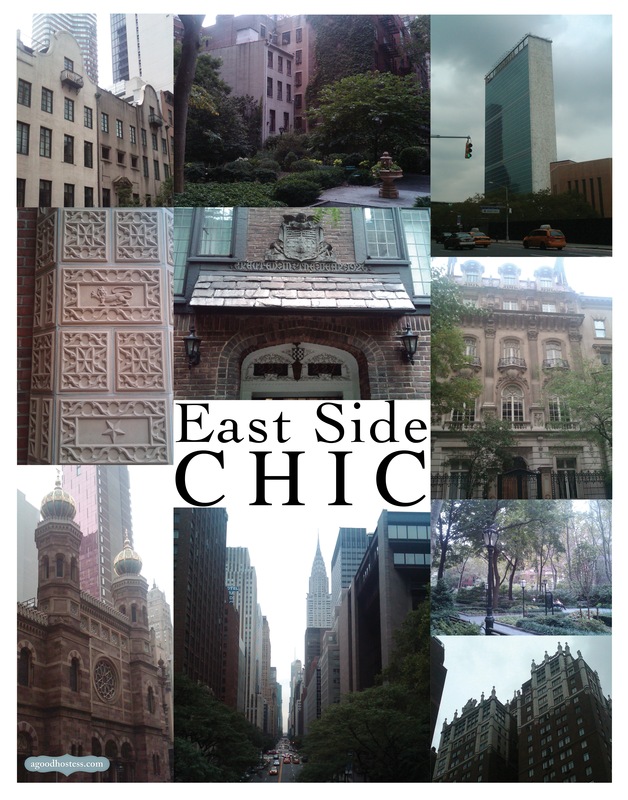 ), then ambled through Tudor City up through Midtown East to the start of the Upper East Side. All over there was amazing architecture, a crazy hodge-podge of global influences (somewhat clockwise from the top left): Façades reminiscent of Amsterdam in Midtown East, the Parisian garden effect at Tudor City Greens, the glittery, flinty glass of the UN, Belle Époque architecture off of 5th Avenue (Vienna or Paris, le sigh), the amazing details on buildings in Tudor City, 42nd Street sightline teaching a lesson in perspective and gilded turrets on Temple Ahawad Chesed on Lexington. For your own jaunt around town, pick an area you haven’t been to before, throw your pre-conceived notions out the window (ie Murray Hill is where post-collegiate fratholes go to burrow), grab your camera and the city will surprise you. More reports of weekend rambles coming soon!